Luciana received the 2011 Canada Games Young Artist of Excellence Award in 2016. She completed her undergrad at Dalhousie University, then relocated to British Columbia to pursue her MFA in directing at UBC. Luciana returned to Halifax in 2018 to participate in Neptune Theatre’s Chrysalis Project, which provides practical experience and mentorship to emerging theatre artists. Devin began playing piano in 2013 at the age of seven, and has won both awards and competitions since then. He was the 2017 recipient of the first ever Gordon Murray rising Star Award, and one of the winners of the 2017/18 Chebucto Symphony Orchestra Concerto Competition, an honour which gave him the opportunity to perform with the Orchestra in the spring of 2018. Ian received Talent Trust scholarships to pursue studies in dance. He trained at the Maritime Conservatory of Performing Arts in Halifax, then attended Canada’s National Ballet School. Ian began teaching ballet after touring with CATS in 2013, and relocated from London, UK back to Canada three years later. Born in Alberta, Charley moved to Nova Scotia to pursue her BFA at NSCAD University. She received the Charlotte Wilson-Hammond/Visual Arts Nova Scotia Award and the Lieutenant Governor Award. Charley is a practing artist who teaches drawing and printmaking at NSCAD University and Mount Allison University in New Brunswick. Lee received the Talent Trust 2011 Canada Games Award in 2017, the year he began the MA Typeface Design program at the University of Reading in the UK, which is considered by many in the design industry as the best in the world. He completed his Bachelor of Interdisciplinary Design at NSCAD University, where he taught as a guest lecturer for two years prior to beginning his MA. Shanice, a soprano born in New Glasgow, Nova Scotia, graduated from Wilfrid Laurier University with an Honours Bachelor of Music in Vocal Performance in 2017. Shanice was Nova Scotia’s alto selection for the 2014 National Youth Choir, and soprano for the 2016 National Youth Choir tour in Alberta. She won the Talent Trust Portia White award in 2016, and received a scholarship in 2018 to continue her voice studies. We would like to introduce you to a new member of the Nova Scotia Talent Trust family, the Nova Scotia Talent Trust Foundation. The NSTT Foundation is a not-for-profit organization, registered in Nova Scotia, with charitable status. The impetus for establishing the NSTT Foundation was a generous legacy gift made by the Nova Scotia Coalition on Arts and Culture who wanted to ensure that their contribution would support the work of the Nova Scotia Talent Trust now and well into the future. This, along with the inevitable consequence of ever-increasing demands made on governments for funding, led us to see the importance of having an endowment fund to provide ongoing, stable funding for the Nova Scotia Talent Trust. 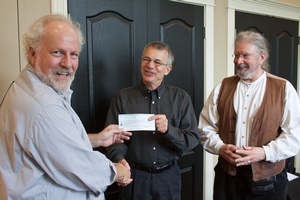 Photo left-right: Peter Mushkat receives NSTT Foundation contribution from Andrew Terris, representative of the Nova Scotia Coalition on Arts and Culture. Adrian Hoffman, Past NSTT Chair, enjoys the moment. The role of the NSTT Foundation is to steward significant resources and make the income available to the NSTT to fund artists in accordance with its mandate. Now, in addition to supporting our developing artists on an annual basis through the NSTT, you can also make a donation to the endowment fund through the NSTT Foundation. Contributions are eligible for a charitable donation receipt. They may be made as a one-time gift or pledged over time. Another way to consider support for the NSTT Foundation is through a bequest in your will. Thank you in advance for considering this way of ensuring Nova Scotia artists in the future will continue to be able to reach their full potential. A member of the volunteer Board of the NSTT Foundation would be happy to meet with you to discuss how best you can ensure the long-term future of the Nova Scotia Talent Trust through this opportunity.